Stating that 2019 election is very important, Tejashwi Yadav who is Leader of the Opposition in the Bihar Assembly, said that BJP has to be defeated in this election, if country and the constitution have to be safeguarded from the RSS and its affiliates. RJD leader Tejashwi Prasad Yadav on Wednesday attacked both Prime Minister Narendra Modi and Bihar Chief Minister Nitish Kumar alleging that the two have cheated the people and hence they should punish them by ousting from the power. While stumping for Congress candidate from Purnea, Uday Singh alias Pappu Singh at a public meeting at Dhamdaha, Mr Yadav exhorted people to make Nitish Kumar "bite the dust" at the hustings when they go out of their homes to cast vote on April 18 in the constituency. It was our Paltu chacha who used to say that he would never ally with BJP come what may (even if he has to bite the dust). 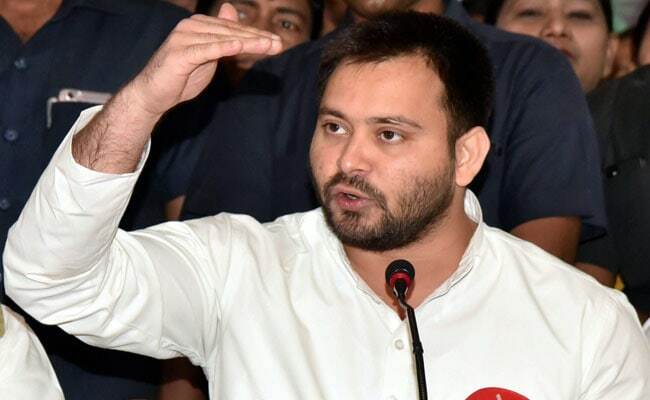 Now it is your turn to make him (Nitish) bite the dust by pressing the hand symbol (Congress symbol) on EVM on April 18, Tejashwi Yadav said. After Nitish Kumar debunked RJD over charges of corruption against Mr Yadav, the then Deputy Chief Minister in the mahagathnandhan government in Bihar, in July 2017 and joined hands with the BJP to form a NDA ministry in the state, Lalu Prasad and his partymen have been attacking him being a "Paltu" (turncoat). Stating that 2019 election is very important, Mr Yadav who is Leader of the Opposition in the Bihar Assembly, said that BJP has to be defeated in this election, if country and the constitution have to be safeguarded from the RSS and its affiliates. There is a threat looming large on the continuation of reservation as they (BJP and RSS) are trying to change the constitution, Mr Yadav alleged. Asserting that Lalu Prasad is the name of not an individual rather of an ideology, Mr Yadav, younger son of the RJD supremo, said fighting for the cause of poor, dalits, deprived sections of the society, he preferred to be demolished (mitna) instead of shaking hands with the BJP.